On Tuesday night, the 2015 Kennedy Center Honors were broadcast on TV. This year’s honorees included singer-songwriter Carole King and classical pianist Seiji Ozawa, as well as George Lucas, Cicely Tyson, and Rita Moreno. Stephen Cobert was tapped as the night's host. In celebration of Carole King's musical achievements, Aretha Franklin, James Taylor, Janelle Monae, Sara Bareilles, and the cast of the Broadway musical Beautiful paid tribute to King. 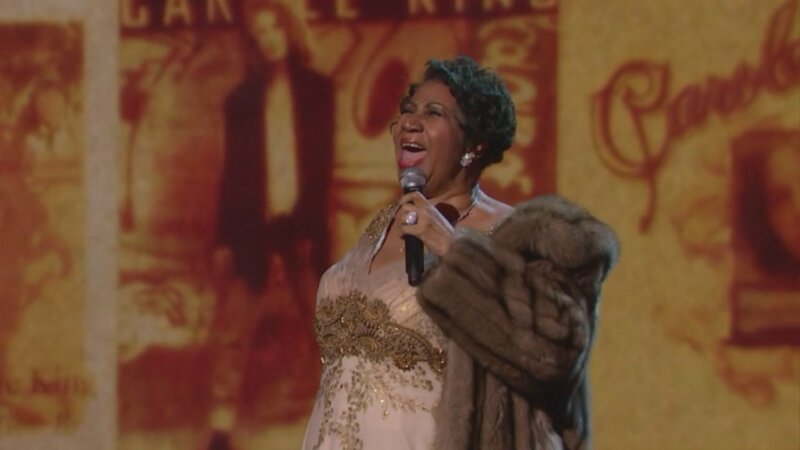 Franklin brought the crowd to their feet with her powerful performance of "(You Make Me Feel Like) A Natural Woman," which was written by King and released by Franklin as a single in 1967. Taylor played "Up On The Roof," Monae sang "Will You Love Me Tomorrow?" and "One Fine Day," and Bareilles covered "You've Got a Friend." Also, be sure to check out the 2014 Kennedy Center Honors tribute to Sting, featuring Lady Gaga, Bruce Springsteen, and Bruno Mars.